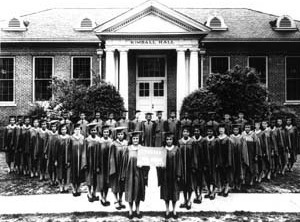 The Morrill Land Grant Act of 1890 created dual segregated higher education systems, requiring states to establish and fund land-grant colleges for Black students, if Black students were excluded from the existing land grant colleges in the state. Land-grant colleges are public higher education institutions funded by the state government. The Act was the second of its kind; the Morrill Land Grant Act of 1862 provided funding for the creation of land-grant colleges across the country. In many states, the colleges established under the 1862 Morrill Act excluded Black students; the 1890 Morrill Act was a direct response to this discrimination. Though the 1890 Morrill Act required states with these dual segregated university systems to provide equal funding to Black and white institutions, the funding provided to land-grant HBCUs was often low and inequitable in comparison to the money given to white land-grant colleges. Black churches and white philanthropists usually provided the primary funding for these colleges and universities. These 19 HBCUs are still serving our community and providing Black students with the education they need to fulfill their goals and dreams. Posted on February 19, 2015 by Black Bottom and tagged Black History Month Black History Wall of Black History 1890 Morrill Act HBCUs.